The Trinity Games by Sean Chercover grabbed me on the first page. I found it to be in-line with thrillers by Dan Brown, David Baldacci and Steve Berry, blending mystery, action and suspense into an epic tale. David Byrne is a Catholic priest looking for a God. After growing up on the bible circuit with his preacher-uncle Tim Trinity, a smooth talking conman, bilking millions of dollars from his followers, David joined the priesthood hoping to find something to fill his spiritual void. He becomes a topnotch investigator for the Church’s Office of Devil’s Advocate. Only problem is the sometimes his superiors want a miracle even if it is full of holes. He’s given a final assignment to investigate Tim Trinity, his uncle, who seems to have suddenly become the real deal, speaking in tongues, predicting the future. Suddenly everyone wants Tim Trinity dead, and David has his hands full keeping his uncle alive. The pace of this book is fast and the 450 pages rolled by. 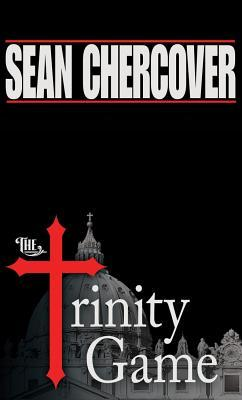 While I didn’t find a Catholic priest questioning his faith, nor depicting corruption in the Catholic church as terribly new, the book was indeed entertaining. It kept me flipping pages until the end to see how it plays out. And it leaves the door wide open for sequels with David Byrne. I give it four thumbs up. well the cover has my attention, anyway!